Be the first to share your favorite memory, photo or story of Regina. This memorial page is dedicated for family, friends and future generations to celebrate the life of their loved one. 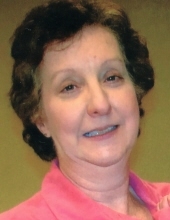 Regina Tickle Hinkle, 62 years of age of Grundy, VA, passed away Sunday, February 24, 2019 at her home with her family by her side. Born June 11, 1956 in Richlands, VA, she was the daughter of Margaret Ann Shull Tickle of Abingdon, VA and the late Freddie Leo Tickle. Regina started working after high school at Clinch Valley Clinic for four years and then retired from Buchanan General Hospital after thirty-two years of service having worked as a Radiology Technician and Supervisor. She loved spending time with her family and cats and was of the Christian faith. A loving sister, aunt and friend. In addition to her parents, she was preceded in death by her husband Wendell Hinkle, sister Katherine Cline, maternal grandparents Frank and Thelma Shull, paternal grandparents William and Maggie Tickle. She is also survived by her feline friends Rudy, Jasper, Patches, Button and Callie. Funeral service for Regina Tickle Hinkle will be held at the Shortridge-Ramey Funeral Home of Grundy, VA, Wednesday, February 27, 2019 at 1:00 p.m. with Roger and Lois Null officiating. Burial will follow in the Greenhills Memory Gardens, Claypool Hill, VA. The family will receive friends at the Shortridge-Ramey Funeral Home Chapel of Grundy, VA, Tuesday, February 26th after 6:00 p.m. with evening service to be held at 7:00 p.m. The family of Regina Tickle Hinkle have entrusted the care of their loved one to Shortridge-Ramey Funeral Home of Grundy, VA.
"Email Address" would like to share the life celebration of Regina Tickle Hinkle. Click on the "link" to go to share a favorite memory or leave a condolence message for the family.